A Whopper of an Epiphany! Everything goes quite swimmingly. Normal. As expected. The way the Service of the Word is supposed to go in the Nazareth synagogue or any synagogue. A portion from the Old Testament lectionary is read. This Sabbath Day — from the prophet Isaiah, chapter 61. A Messiah text! God’s-promise-of-the-Savior-Messiah-and-the-salvation-He-will-bestow-on-Israel-TEXT! Then everything changes! Significantly! Remarkably! Jesus, who just read the Isaiah text from the lectern throws the congregation a huge curve ball! Joseph’s son has the audacity – the unmitigated gall – to preach something that had never ever been proclaimed at a Sabbath Day synagogue Service of the Word! A sermon like this had never been preached before! No one ever dared to! Until now! IT’S A WHOPPER OF AN EPIPHANY! Everyone who hears it is amazed. Dumbfounded. Marveled. Why? Are you picking up what Preacher Jesus is throwing down? Yes, that’s right! He’s categorically asserting that He is the promised Messiah! Standing right before the eyes of Synagogue Nazareth is the long awaited Savior! The sermon is the epiphany, the revelation, the unwrapping of “the mystery hidden for ages and generations but now revealed to his saints,” (Col 1:26). The Savior is here! He has arrived! Jesus fulfills the Old Testament and its promise of salvation! Incredible! Joyfully wonderful! For those that believe the preached sermon! Nothing new here! Israel had the very bad spiritual habit of rejecting preachers God sent and their message of repentance and their call for them to be God’s hangers on or trust-ers. Jesus points out that sad history. And more. Especially that God’s grace will go to the Gentiles if Israel continues to refuse it. Just like when Israel wouldn’t listen to Elijah, God sent him to the Sidonian widow woman for her turning from and dying to her sin and being raised to new life spelled F-A-I-T-H. When Israel wouldn’t heed the call to repentance and faith, God sent Elisha to the Syrian commander Naaman to save him from his leprosy so that he too would repent and believe. Here today in Nazareth Jesus will give nary a sign like He did at Capernaum to epiphany His Messiah-ship! For example, at Capernaum He healed the lame man and forgave him his sin (Mk 2:1-12). At Nazareth they only get a sermon! The preaching is the epiphany! 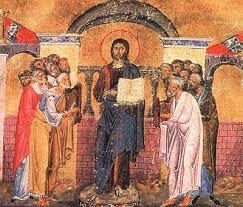 “Today this Scripture has been fulfilled in your hearing.” That’s what the Nazareth-ers are given to believe. Well, they don’t! The Nazareth synagogue will not repent nor believe! They’re offended. They are at the unbelief point! “Filled with wrath.” It’s just as Jesus said: “No prophet is acceptable in his hometown.” So, the Nazareth-ers take matters into their own hands. They will Wild West-ly execute false preacher and blasphemer Jesus. “They rose up and drove him out of the town and brought him to the brow of the hill … so that they could throw him down the cliff.” They’d throw him off the precipice backwards. If He survived, they would have hurled heavy stones the size of basketballs to finish the job. Yes, it’s just as the old man Zechariah told Mary and Joseph at the temple as recorded earlier in Luke. “Behold, this child [Jesus] is appointed for the fall and rising of many in Israel, and for a sign that is opposed,” (Lk 2:34). At Nazareth we see this quite clearly. However, the Today-this-Scripture-has-been-fulfilled-in-your-hearing-sermon is also for the rising of many! For many’s repentance and faith! Yours! Yes, even your repentance. Your turning from sin and dying to it so that you turn to God in Jesus for His Good Friday forgiveness and live a new life spelled F-A-I-T-H. I warn you don’t pull a Nazareth. Unbelief Nazareth. If you do, it will end hellishly for you. Jesus isn’t murdered at Nazareth. His Good Friday hour hasn’t come yet. “Passing through their midst, he went away.” More places to preach. More people to hear. For their repentance and faith. Until it all climaxes on the hill in which He is nailed on the cross and then rises from the empty tomb. Every time you’re at the divine service where the Service of the Word and Service of the Sacrament are going on, the Messianic salvation promised through the prophet Isaiah and all the rest of the Old Testament prophets IS FULFILLED IN YOUR HEARING! Every Sunday is a SALVATIONAL EPIPHANY WHOPPER!